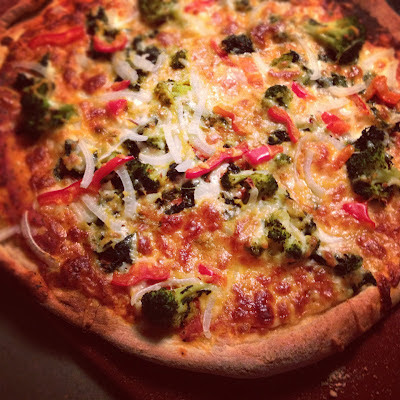 Last night we decided to make a quick and easy veggie pizza. No....I'm not under the illusion that this is healthy just because it is loaded with veggies. But, with a whole wheat pizza crust, tons of vegetables, and part skim cheese, it is at least "semi-guilt-free"...that's a thing...right?!?! Anyway, we bought the pizza dough at the grocery store, and Stephen is able to roll it into two thin crust pizza's. I topped it with sauce (the only time I ever use jarred sauce), part-skim mozzarella and cheddar cheese, sliced red peppers, and onions. I also sauteed some frozen spinach with broccoli florets, with lot's of garlic.....and loaded that on top too. I cooked it according to the directions for the dough (400 degrees for about 20 minutes)...SO easy!